Sustaining and growing a cloud practice requires investment in skill development. From our research, we’ve seen that our most successful cloud partners are doing just that. Whether you need to fill a skills gap or are looking to improve your team’s overall skill set, it’s clear that technical training is a key to success. Maybe you’re new to Azure or maybe you’re already an experienced cloud professional. Whatever the case may be, training will help you unlock new opportunities. 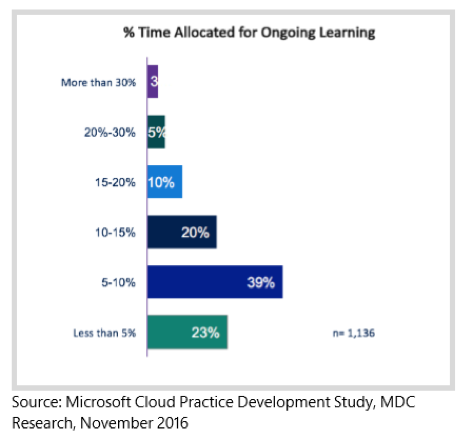 In fact, through the Microsoft Cloud Practice Development Study, we found that partners spend a median of 8.5% of their technical resource time on training. To make the most of your time, and keep both you and your employees skilled in the latest cloud technologies, we recently launched multiple Azure skills training courses. Our growing list of Massively Open Online Courses (MOOCs) allows you to learn at your own pace in an interactive, online environment. These trainings offer the chance to move forward with your own skill-building through videos, labs, graded assessments, and more. Better yet, to show our commitment to helping you make the most of your training, we’re constantly improving our courses. Because technology can change quickly, we’re updating the current versions of our many existing Azure-focused MOOCs so you can learn from the most up-to-date information, refreshed assessments, and new labs. Currently, 11 courses have been refreshed, and there are new courses on the way. If you are in the process of completing a previous version of the refreshed course, you can still finish the course and earn the digital certificate. Today, I’m excited to announce that many of our courses — including practice tests and exams — are available in multiple languages such as Spanish, traditional Chinese, Japanese, German, French, Portuguese, and Russian. To find courses available in your preferred language, use the “filter by language” option when searching for Azure skills training. Be sure to check the list often, as new courses are being localized every day. To make sure our partners have the skills they need, we’re also offering opportunities for Azure certification at a deep discount. If you want to prove your skills in a single area, you can purchase a single exam, retake, and practice test for $99 USD. If you want to prove your broad cloud mastery, you can purchase three exams, retakes, and practice tests for $279 USD. Available now through June 30 only, this is a major discount from market value. We’re also excited to partner with the Linux Foundation to offer an optional add-on discount toward Linux certification. While the supplies last, buy the Azure Single Pack or Azure Triple Pack and qualify for a unique coupon code to purchase the Linux Foundation Certified System Administrator (LFCS) exam for $99 USD (regular price $300 USD). This offer is also only available now through June 30. We hope you can use these different training options to add Azure to your toolbox and become a more nimble, more successful cloud solutions provider. We look forward to providing more opportunities for you to continue growing your cloud muscle and accelerate your business with Azure. Which Azure training course have you found most helpful? Share your thoughts in the comments below.